Thousands of travelers were trying to make it home Thursday after the fierce storm stranded them at airports or relatives' homes around the region. CONCORD, N.H. — A muted version of a winter storm that has killed more than a dozen people across the eastern half of the country plodded across the Northeast on Thursday, trapping airliners in snow or mud and frustrating travelers still trying to return home after Christmas. The storm, which was blamed for at least 16 deaths farther south and west, brought plenty of wind, rain and snow to the Northeast when it blew in Wednesday night. 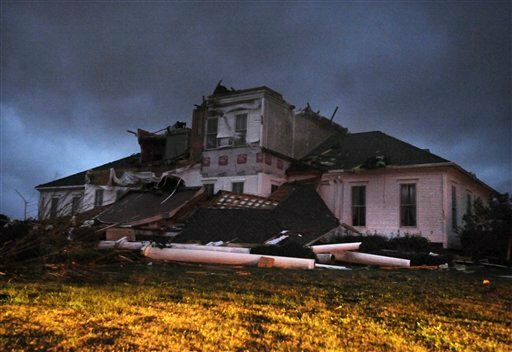 Lights generally remained on and cars mostly stayed on the road, unlike many harder-hit places including Arkansas, where 200,000 homes and businesses lost power. By afternoon, the precipitation had stopped in parts of Pennsylvania, New Jersey, and Massachusetts, though snow continued to fall in upstate New York and northern New England. Parts of snow-savvy New Hampshire expected as much as 18 inches. Dale Lamprey, who was clearing off the sidewalk outside the legislative office building in Concord, already had several hours of shoveling under his belt by 8:30 a.m. Thursday and didn’t expect it to get much better. The Northeast’s heaviest snowfall was expected to be in northern Pennsylvania, upstate New York and inland sections of several New England states before the storm heads into Canada on Friday, National Weather Service spokesman David Roth said. While the East Coast’s largest cities — New York, Philadelphia and Boston — saw mostly high winds and cold rain, other areas experienced a messy mix of rain and snow that slowed commuters and those still heading home from holiday trips. Some inbound flights were delayed in Philadelphia and New York’s LaGuardia, but the weather wasn’t leading to delays at other major East Coast airports. Forty-two students traveling to London and Dublin were stuck in the Nashville airport thanks to weather in the Northeast. The frustrated students, from universities in Tennessee and Kentucky, were supposed to leave Wednesday and arrive in London on Thursday. Joe Woolley, spokesman for the Cooperative Center for Study Abroad, said he hopes he can get them there just one day late. “It’s a two-week program, so it’s shortened already,” he said. On New York’s Long Island, a Southwest Airlines jet bound for Tampa, Fla., veered off a taxiway and got stuck in mud Thursday morning. Officials said there were no injuries to the 129 passengers and five crew members. Though the area received heavy rain overnight, Southwest spokesman Paul Flanigan said it wasn’t clear whether that played a role. In Pittsburgh, a flight that landed safely during the storm Wednesday night got stuck in several inches of snow on the tarmac about two hours. The American Airlines flight arrived between 8 and 9 p.m., but then ran over a snow patch and got stuck. 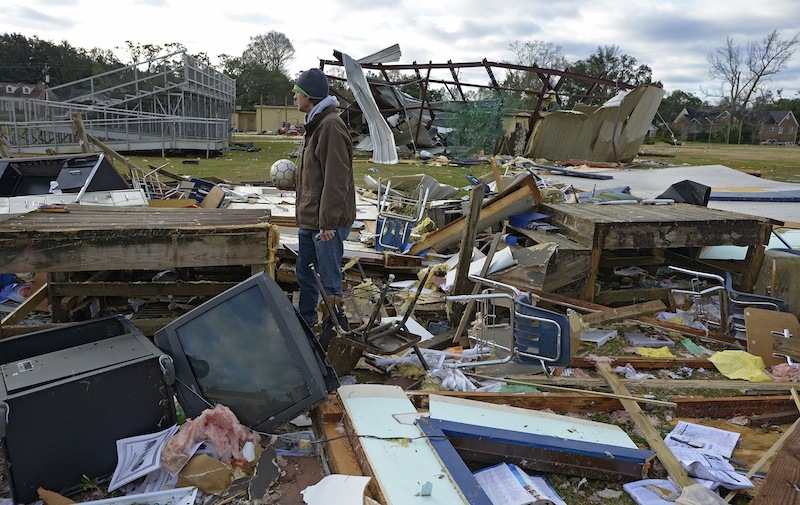 Earlier, the storm system spawned tornadoes on Christmas along the Gulf Coast, startling people like Bob and Sherry Sims of Mobile, Ala., who had just finished dinner. 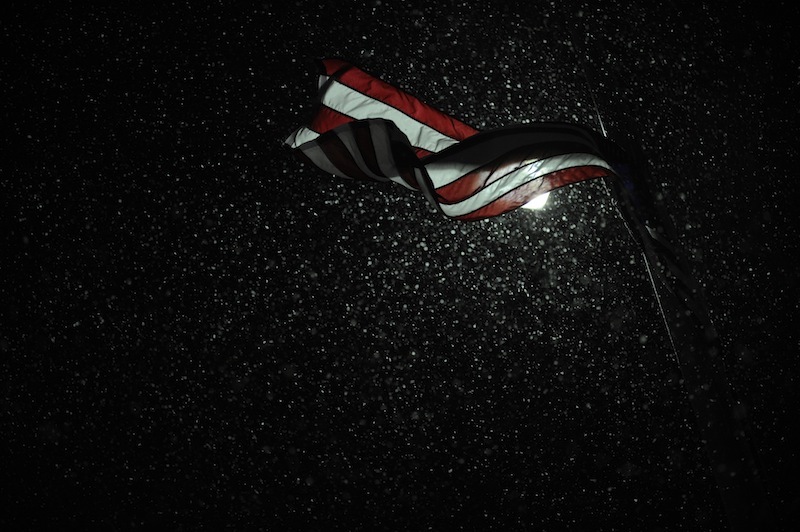 “We heard that very distinct sound, like a freight train,” said Bob Sims, who lost electricity but was grateful that he fared better than neighbors whose roofs were peeled away and porches smashed by falling trees. In Georgiana, Ala., an 81-year-old man died Wednesday, a day after a tree fell on his home, emergency officials said. 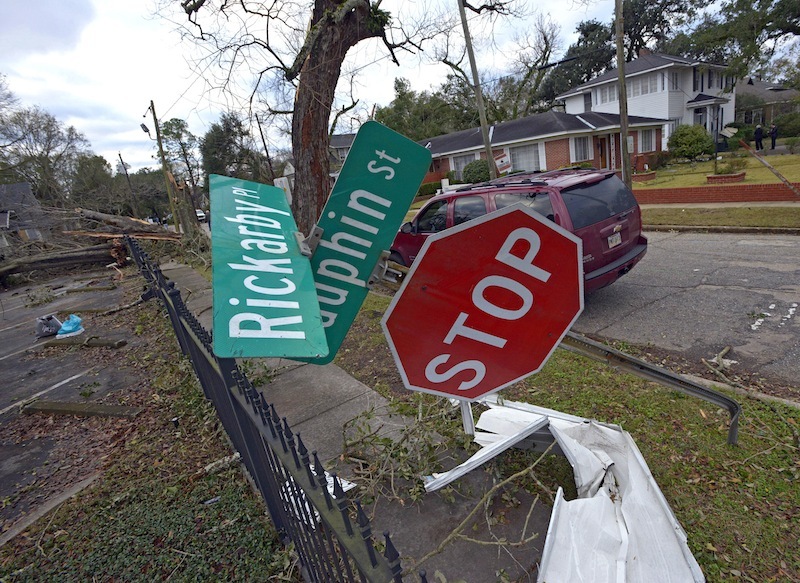 Deaths from wind-toppled trees also were reported in Texas and Louisiana, but car crashes caused most of the fatalities. Two people were killed in Kentucky crashes, a New York man was killed after his pickup truck skidded on an icy road in northwest Pennsylvania, and an Ohio teenager died after losing control of her car and smashing into an oncoming snowplow. In Arkansas, where two people died in a head-on collision, some of those who lost electricity could be without it for as long as a week because of snapped poles and wires after ice and 10 inches of snow coated power lines, said the state’s largest utility, Entergy Arkansas. 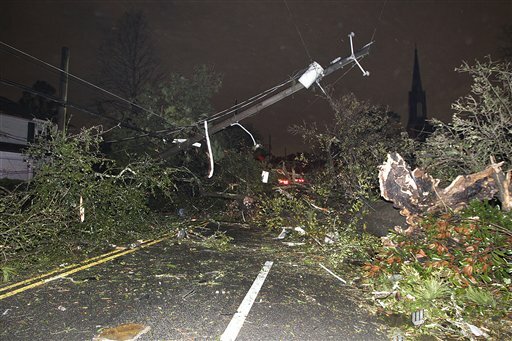 Farther east, the storm knocked out power to more than 7,000 homes and businesses in Maryland, and utilities were preparing for more outages as the wind picked up. In New Jersey, gusts of more than 70 mph were recorded along the coast, and the weather service issued a flood warning for some coastal areas. There were about 800 power outages in Vermont, but only a handful in neighboring New Hampshire. Schools on break and workers taking holiday vacations meant that many people could avoid messy commutes, but those who had to travel were urged to avoid it.